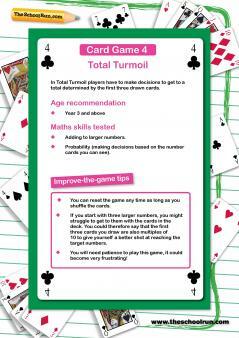 Card games help take the fear out of maths and build children's number confidence – the fun way. 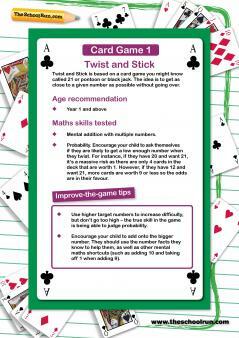 Find out more about the mathematical benefits of playing cards as a family, then put the theory into practice with one of our primary-school maths games. An all-ages game which helps children understand probability as well as helping them practise basic mental maths skills. Great for Y1 and Y2 children who are learning number bonds and simple number facts. A tricky game for upper KS2 kids, this game builds confidence with mixed numbers / improper fractions. Mental addition practice in game form, suitable for Year 3 and above. 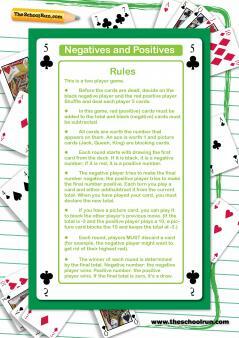 Designed to improve your child's understanding of positive and negative numbers. Great for encouraging number recognition and ordering for younger children, this game also helps older children with probability.